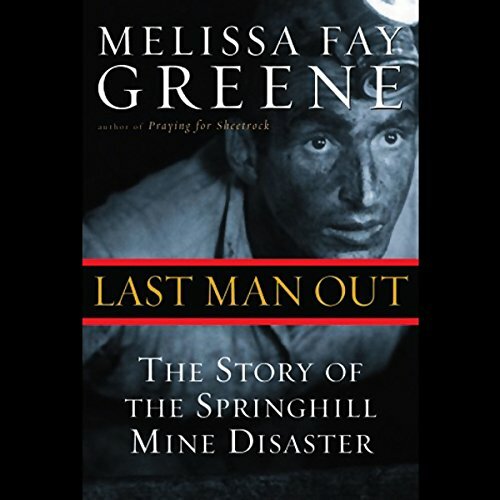 Melissa Faye Greene stunningly unfolds the story of the Springhill, Nova Scotia, mine disaster, a drama that seems especially hard-hitting in light of more recent mine collapses. In 1958, gases were propelled three levels upward, trapping men against the ceiling and burying them. One hundred men had entered the dangerously built mine Number Two; 75 never saw the light of day again. Two groups of men did survive, although their struggle was immense and almost unbelievable. They were forced to wait days until rescue, coming close to death. Meanwhile, the rescuers had to endure the painstaking ordeal of reaching the men without creating more problems, and the families had to expect the worst and hope for the best. Greene not only tells the tales of the 19 men who survived, but also recalls the memories of those who were never found. Last Man Out is a powerful story of heroism, terror, pain, and survival. Last Man Out is the taut, harrowing story of the 1958 Spring Hill, Nova Scotia mine disaster which killed 75 men. But there's another twist. Following the dramatic rescue of 19 survivers, who had spent a week underground, an aide to Georgia's racist governor has a brainstorm: publicize the state's fledgling tourist industry by treating the heroic miners and their families to a vacation on Jekyll Island. The media spotlight indeed shines on Georgia when the lone black survivor is barred from the state's segregated facilities. This miner has his 15 minutes of fame, but with unforseen consequences. Melissa Faye Greene tells how the brief glare of international publicity, followed by years of neglect, affected the impoverished community of Spring Hill, Nova Scotia. It's riveting history, very well written and well narrated. This was a pleasant surprise. Excellent story, very compelling. Excellent narration.